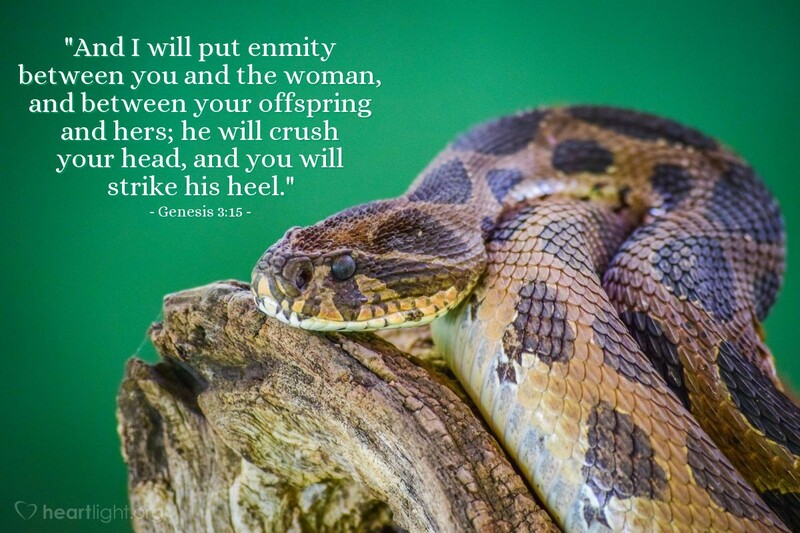 This is God's curse upon the serpent who tempted Eve and Adam to sin. Satan is the personality behind the serpent. Even in this curse, even in the recognition of a struggle between the woman's offspring and Satan, God embeds his promise for our better future. In Jesus, that future comes! Satan appears to win the battle at the Cross, but the passage of three days changes everything. Jesus' triumph over death leaves him with only a "bruised heel," but leaves Satan powerless to make death the final word. The Evil One's best plans and greatest power lie crushed at the doorway of Jesus' empty tomb! Thank you, dear Father, for taking the stinger out of death and establishing an assured hope for my future. Not only do I believe that Jesus rose from the dead, but I also believe you will also raise me up and bless me with life forever in your presence. For this enduring victory, I praise you in Jesus' name. Amen.